I am a huge fan of scripts, in which familiar places/landmarks, play an important role. For instance, I cannot stop talking about Manipal Center near M G Road, Bengaluru, whenever I pass by that landmark. It was here, Nishkarsha, a heist thriller Kannada movie of the 90s, was shot. In U-Turn, it is the double road flyover near Richmond Circle! This familiarity with the places makes a special connection with the audience. Though Pawan keeps the mystery element till the end of the movie, he also gives some clues at times. In the very first scene, you can hear repeated utterances of Karma in background. You can find some more during the course of the movie. It is an edge of the seat thriller and keeps the audience guessing till the last scene. Kendasampige was the last thriller I enjoyed in Kannada, which goes on similar lines. RangiTaranga came before that. It's raining thrillers in Kannada! There are no regular songs in the movie - a bold and encouraging move. With a tight script like U-Turn, you can do away with the needless songs most of the times. People who are keen on understanding the basics of movie making can easily find out how a very simple story can be developed into a full blown movie. Kudos to Pawan for that. If your expectations are high of the movie after watching Lucia, I would say lower them and enjoy this movie with a fresh mindset. Real portrayal of police department - One could also observe how our law and order system works adhering to rules and regulations. It is not one of those movies, where a cop turns super villain and puts an innocent behind bars without proper investigation. Whether you should watch the movie: I would say watch it for its engaging screenplay and simplicity of the script and of course, for the exciting twists in the story. On the general theme of the movie: I read somewhere that developing countries lack the resources and manpower to enforce the regulations in civic administration – be it traffic regulation or tax collection. Though it is true to most extent, it is the basic civic sense, which is lacking in majority of population. If people mend their ways after watching U-Turn, I believe Pawan’s efforts have paid off! Update 14th June 2016 (Spoiler Alert) : Director Pawan Kumar has revealed what was the inspiration behind the unconventional movie - U Turn. Actor Sudeep had asked Pawan in Twitter, how did such a concept come to Pawan's mind. For which, Pawan replied saying "Once he was travelling via the flyover, it was raining. Street lights were switched off. He was driving his car, when he noticed few blocks of the road divider being removed to take the U-Turn. He was too scared at that time." Now, you can notice the simplicity of script, if you have already watched the movie. You can watch Pawan's answering Sudeep's question in the following video. I hope the message is the delivered to all and people think twice before violating the traffic rules . That's right Sandeep. I believe being simple in its presentation U-Turn has potential to reach far wide audience subtly. Yes, I recognized Gopalan Kennedy! Also, auto driver in the first scene was Rajath Mayee who work as assistant director to Pawan and arranged the workshop; called us for the press shoot scene in Lucia! That's great Susha! My views matching with that of my readers is a great compliment for me :) Nice to know good Kannada movies making waves outside India! 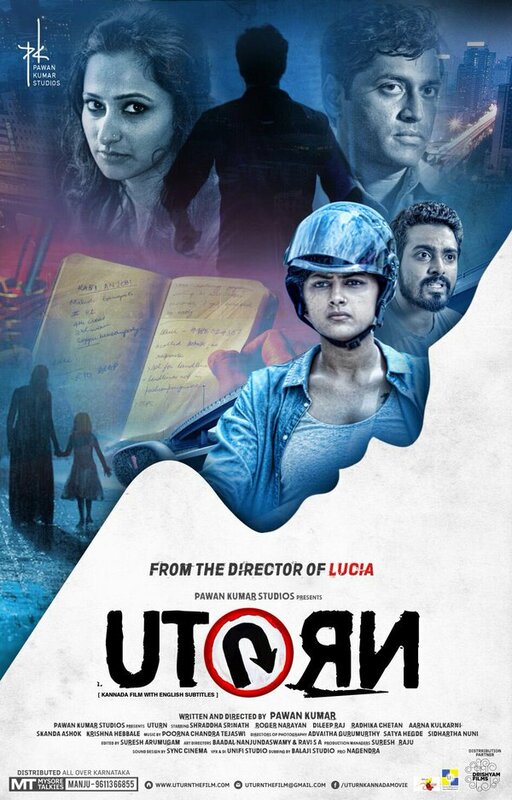 Happy to note that you thoroughly enjoyed the movie - U Turn! Now, don't miss GBSM - it will soon hit Malaysia... after European tour!